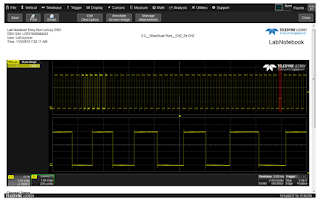 If we really want to get the most out of our oscilloscopes, we'd be remiss in overlooking the documentation capabilities that modern instruments provide. It's so important to document our working sessions so they're consistent and repeatable. 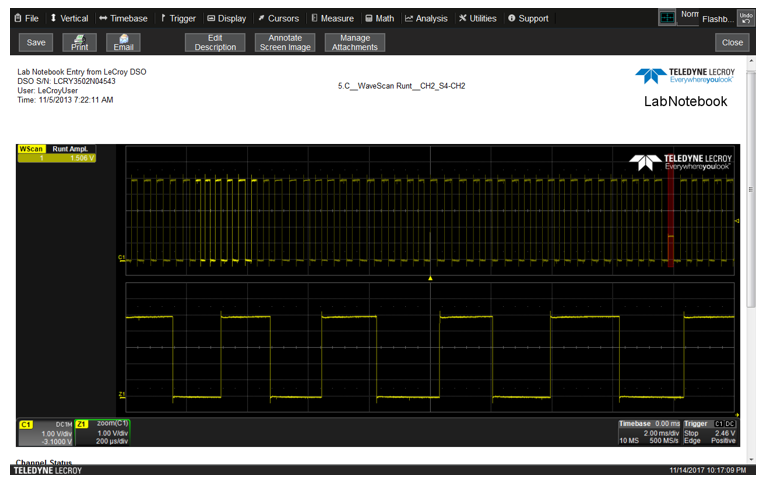 Oscilloscope setups can be quite intricate for a given measurement or procedure. Why not let the instrument help us keep track of such things? 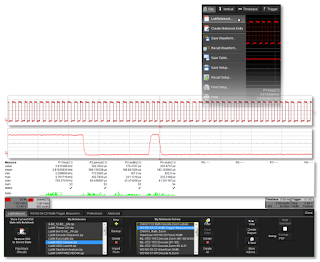 The best way to accomplish this on Teledyne LeCroy's oscilloscopes is with the LabNotebook utility, which, on most models, can be found in the File dropdown menu at the top left of the display. A LabNotebook entry saves waveforms, oscilloscope setups, and screen images, which can be annotated for later reference (Figure 1). MatLab, MathCad, or audio. Screen image formats include .jpg, .png, .tif, and .bmp. Setups are saves as .lss files. LabNotebook quickly and easily generates reports that capture the screen image and all of the important acquisition settings. You can generate a report from a LabNotebook file (.lnb) or directly from the oscilloscope setup in .pdf, HTML, or .rdf formats. These reports can be stored internally to the oscilloscope's disk drive, on a network, or to external storage media. You can also email a LabNotebook report directly from the oscilloscope. Saving all of this information in one file is extremely useful, but what's even more useful is the Flashback function, which retrieves all of that data and automatically restores the oscilloscope to the state it was in when you created the .lnb file. You can then continue making measurements using that setup, or the previous measurements can modified or added to so as to reanalyze the existing data. LabNotebook facilitates collaborative work in that you can easily annotate the screen images with the included Scribble tool to include notes and/or highlight areas of interest. Colleagues anywhere in the world can flash the .lnb file to their own Teledyne LeCroy oscilloscope and get right to work as if they were at the bench beside you. LabNotebook is a standard feature of Teledyne LeCroy's advanced MAUI with OneTouch user interface.